The Young Authors Collective, or YAC, is a group of talented, word-obsessed high school writers dedicated to experimenting with new creative forms, collaborating with other arts organizations, and writing a ton. We meet once a week at Lighthouse to generate new pieces, give friendly feedback, and work towards publication. YAC members work with some of Lighthouse’s best faculty and have the opportunity to meet visiting authors. And YAC members attend Lighthouse’s literary events throughout the year. YAC meets at Lighthouse on Wednesdays from 4:00 to 6:00 PM and has a maximum of 12 students. Tuition is $450 per semester; financial aid is available. Students may also be eligible for community service hours based on their attendance and the requirements of their high school. 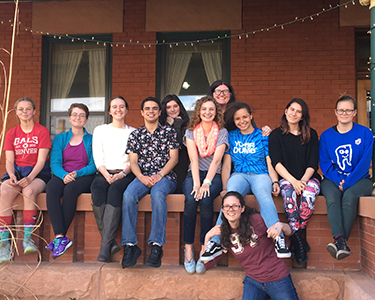 Participating in the YAC is a great way for teens to hone their craft, demonstrate leadership in the literary community, learn about the process of becoming published, and make new writer friends. The YAC experiments with writing on their very own blog, which they created in 2016. Applications for the 2019-2020 school year will be open from February to August 2019.